Salmon in foil with spinach and cream, as prepared by students at Wiggins School during week five of the spring 2019 My Daughter's Kitchen cooking program. Bayard Taylor chefs Mirelyz Perez, Brittany Vasquez, and Jayden Murphy assemble colorful and healthy portions of salmon in foil with spinach & cream during week five of the spring 2019 My Daughter's Kitchen cooking program. “New” and “unusual” are two things that get kids’ attention, and in week five our class was no exception. When we told them we were going to cook a meal in tinfoil tents, their ears pricked right up. It didn’t matter that they weren’t sure they would like salmon, or the spinach and cream that would be cooked with it. They were eager to get going. With perfect teamwork, they read off the ingredients one by one and assembled them on the cooking island. They could see right away this was going to be a colorful meal, with bright orange salmon and fresh green spinach. And they were intrigued they were going to try a new spice — tarragon — along with shallots. When told shallots needed to be peeled like garlic cloves, Jayden and Mirelyz Perez volunteered. As they peeled and minced, Gabriel Ortiz seasoned the salmon with salt and pepper and Bryttanye Vasquez zested the lemon. Our young chefs love lemons and enjoyed sniffing the tart lemon aroma (and cutting the fruit into wedges for a fresh snack). Mirelyz got the foil ready, while Jayden and Gabriel plucked stems from the spinach. Then it was time for assembly, and each chef picked a piece of salmon and got to work. Everyone was impressed by how colorful the foods looked when assembled, and some couldn’t wait to try them. “I want to eat this right now!” Bryttanye exclaimed, bending over to smell the tarragon and lemon zest on top of her fish. After adding the half-and-half, each chef assembled a foil tent in their own style while learning that the creamy liquid would help cook the fish and keep it moist. When the salmon came out, they were like kids opening presents at a birthday party, eager to see what was inside. “I give it a thumbs up,” Jayden said. Mirelyz wasn’t quite as enthusiastic. “I give it a middle thumbs up — 50-50,” she said. Calvin Johnson and Yadiel Riuz try the salmon in foil with spinach and cream that they learned to make during week five of the spring 2019 My Daughter's Kitchen cooking program at Hunter. If you’re searching for someone to promote the “salmon in foil with spinach and cream” recipe, you need to look no further than Calvin Johnson and Yadiel Riuz at Hunter Elementary. “This is amazing!” exclaimed Calvin. “OH MY GOSH it’s delicious...so many good flavors!” echoed Yadiel. In fact, Yadiel was enjoying the meal so much he didn’t even notice he had salmon cream running down his chin. His friend, Calvin, reminded him to practice good table manners and use his napkin. Then Calvin added, “My mom tells me to be respectful...and you also have to be kind.” Kudos to Calvin and his mom. We could use more kindness in this world. Lealin Mas and Dayandelis Delgado -Salado season the salmon and spinach during week five of the spring 2019 session of My Daughter's Kitchen at Lewis Elkin. This week we cooked brain food: salmon — a fish that no one in our class had ever tasted before. We definitely had skeptical students. However the beautiful pinkish-orange color of the salmon enticed students to touch the slimy protein. Lealin Mas and Yaslyn Garcia both commented that it felt like art class since they were folding the foil around the fish and seasoning it with the aromatic herb, tarragon. We quickly came to the conclusion that these tin foil packets must have been the original inspiration for the Hot Pocket frozen food item that sells in supermarkets... except that our salmon pockets were fresh, low-fat and nutrient-packed to nourish the brain and satisfy the belly. Marialis Rodriguez, Jayla Velazquez, Jazziarah Williams and Ivy Showell assemble salmon packets during week five of the spring 2019 My Daughter's Kitchen cooking program at Feltonville School of Arts and Sciences. LiLa Mora, Maeve Taffe, and Erica Gogan slice lemons for salmon in foil with spinach and cream during week five of the spring 2019 My Daughter's Kitchen cooking program at Comly. “The smell reminds me of when I go fishing,” Maeve Taffe said. “I really have the urge to get right to work!” And they did. The rest of the kids separated the items and started to get to work. Erica Gogan loves lemons, and immediately began grating the lemon, inhaling the lemony aroma each time. They looked like a well-oiled machine, and knew exactly what to do by this week. The culinary kids were super excited to use aluminum foil to bake the fish in because it meant less to clean up. Everyone took a turn seasoning the fish. LiLa Mora said, “I never heard of tarragon, and I think it smells like chili powder.” The shallot was a new ingredient for all of the Comly Culinary Kids. But once Jaesha Benjamin started mincing it, he knew it was from the onion family. We all agreed. This was delicious! Tyrone Baker and A'Zon Young share some leftover salmon during week five of the spring 2019 My Daughter's Kitchen cooking program at Wiggins. Students learned to prepare salmon in foil with spinach and cream. The students came into this week with much curiosity. 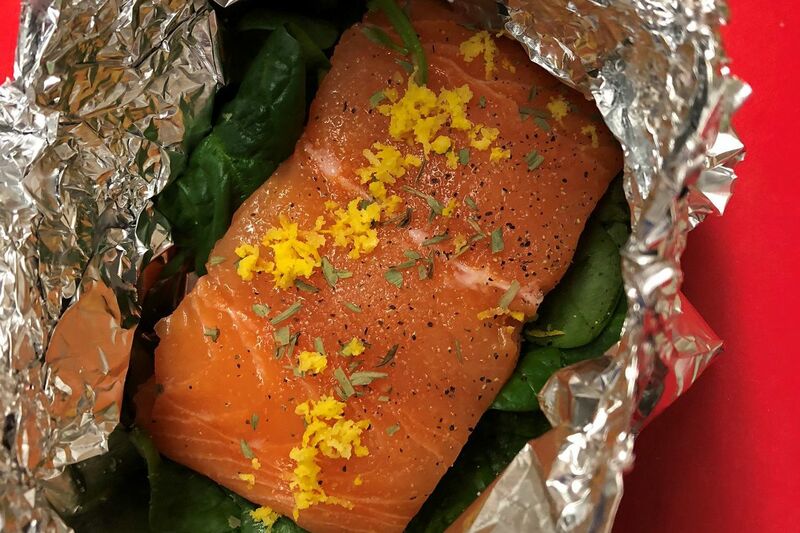 Those who had tried salmon said they hadn’t really cared for it, but the idea of baking salmon with spinach and cream in a foil tent seemed fun. As we worked, our school nurse and program volunteer Annamiek VanLaar explained the nutritional value of salmon and quinoa. “It’s like we’re camping,” said Umar Drinkard, as we finally unwrapped the foil and transferred the salmon onto our plates. Students at LaSalle Academy learn to prepare salmon in foil with spinach and cream during week five of the spring 2019 My Daughter's Kitchen cooking program. The salmon was a 10/10! They not only loved the process of putting the foil packets together — James Brown was a pro at zesting the lemon — but they were all so pleasantly surprised by how quickly the dish cooked in the foil packet and how moist and flavorful it was. They were not thrilled with the quinoa last week; so this week, instead of water, we cooked the quinoa in low-sodium chicken broth. A minor change with positive results: They all liked it much better this week! Lorianna Gil-Lalondriz, Kaylie Cafferty, Joseph Alejandro, Yesennia Juela, and Julian Lebron try the salmon in foil with spinach and cream during week five of the spring 2019 My Daughter's Kitchen cooking program at Robert B. Pollock Elementary School. Sophia Heavens and Laziz Davranov prepare their salmon foil packets during week five of the spring 2019 My Daughter's Kitchen cooking program at Loesche. This week was supposed to be the favorite recipe, so we thought, “We will see. ...” Reading the recipe, we noticed there was not a lot of preparation to do. We began the chopping, and then began to prepare the foil packets. Jane Pupis gave the students a demonstration first, so they were able to do their own packets. We even marked their names on the parchment paper. The quinoa was easy to prepare because they did that last week in our electric fry pan. While everything was cooking, we had a chance to review the recipes for the next two weeks. “So what is your favorite so far?” asked Susan Munafo. There were different answers. Because we had some extra time, the students practiced segmenting an orange, in preparation for next week. “This is a lot of work for a salad,” Vincent Vadeanu commented. Everyone agreed, but they did a great job with the oranges. They agreed that best part was eating them, later, with the fish. Finally the foil salmon packs were finished. When they were opened, there were cries of “Wow!” and “That looks delicious!” Once we tasted it, everyone loved it. “Hey, what happened to the cream we added?” asked Sophia. It had become a clear sauce that tasted great. “I think this is the favorite,” said CJ. I guess we will just have to wait until the last week to decide. Jazmine Torres and Keegan Conard season the salmon packets during week five of the spring 2019 My Daughter's Kitchen cooking program at Blessed Trinity Regional Catholic School. This week’s recipe was great! The kids LOVED it. Only one student had tried salmon before, but they all really loved it and finished their plates. In fact, Vincent’s family wanted him to make the recipe for that night’s dinner. And Keegan and her mom, (who helps with this year’s class,) are making it tomorrow night! Leila Anderson and Zayniyah Mercado learn to make salmon in foil with spinach and cream during week five of the spring 2019 My Daughter's Kitchen cooking program at Sacred Heart. During this week’s class we made salmon in foil with spinach and cream. Overall the girls loved it. They were not too enthusiastic about trying the salmon but it turns out it was one of their favorite meals that we have made so far! Most of them had never had salmon before and really enjoyed it. They described it as “delicious” and “full of flavor”. Once all of our other activities were accomplished and we were waiting for the salmon to cook, the girls looked over some kid’s cookbooks that we brought, and all the girls were really inspired to cook at home. It was a great activity. Overall, it was a great class full of teamwork and yummy food! Brianna Thornton grates ingredients for the salmon recipe during week five of the spring 2019 My Daughter's Kitchen cooking program at St. Augustine Academy. Jocelyn Bastida had never had salmon before, but she started right in mincing the shallots. “They made me cry, but not as bad as onions,” she said. Keymoni Thorton thought is was a quick recipe and loved the taste. “Kind of like wrapping a burrito,” she commented as she made the salmon packets. Jermaine Brown mans the stovetop during week five of the spring 2019 My Daughter's Kitchen cooking program at Urban Promise. The Urban Promise kitchen doubled up this week, making both the chicken soup recipe that students missed earlier in the semester and week five's recipe of Salmon in Foil with Spinach and Cream. The UrbanPromise kitchen doubled up this week, making both the chicken soup we missed in February and today’s recipe for Salmon in Foil with Spinach and Cream. Before we started, we asked who liked eating fish. With a show of hands, everyone surprisingly did. “But I don’t like soup,” said Malaysia Williams. Today’s recipes gave our group the chance to do some different things, including zesting a lemon. Without a zester, we improvised with a vegetable peeler. We sat down to a two-course meal. “My first thought is that everything looks pretty good,” said Adir Harris. “Wow,” said Jermaine Brown, “This lemon zest really brightens up this dish!” However he and his classmates asked for salt to sprinkle on the soup and on the salmon. We used meal time to talk about how other flavors such as lemon and tarragon can replace extra salt in cooking.